There has been much talk in recent years across the charismatic church, about receiving the “mantles” of those gone on before us. In context, much of this originates from the story of Elijah and Elisha. As far as the prophetic ministry is concerned Paul Cain was well known and respected as a prophet across the Church. I honour him for the way that he walked consistently in the things of God over the decades. He had terrific stories that involve Church leaders, Presidents and world leaders since the 1940’s. Paul Cain, 1929-2019, He ran the race and fiished well! Sorely missed. I know many of his personal stories and the sacrifices he made following in obedience. There has been a cost, but Paul, in humility rarely mentioned those things. Paul had been following the leading of the Spirit and having his adventures with God before many who read this were born! If you want to read his story some of it is found on his website. As one of Paul Cain’s closest friends, however, I can tell you that I don’t want his mantle. 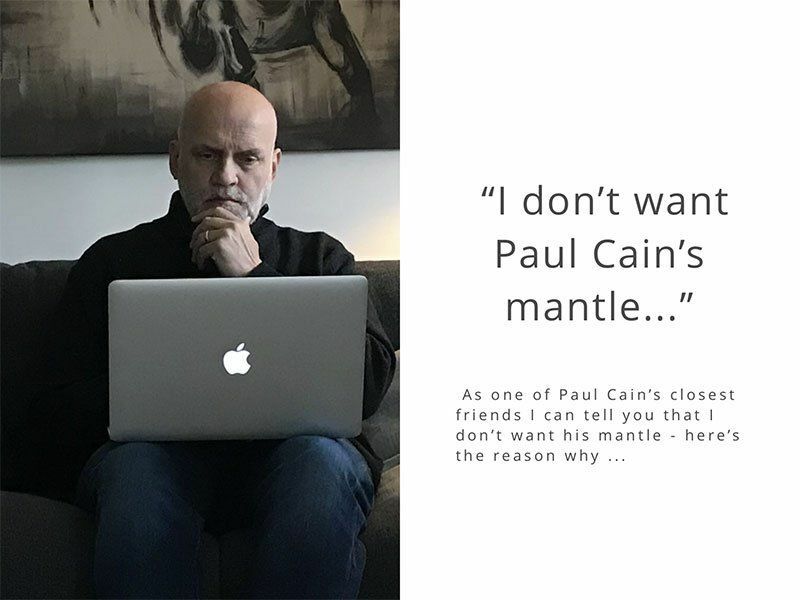 It’s not just Paul’s mantle – I don’t want Elijah’s, Smith Wigglesworth’s or Billy Graham’s either! I’m not being ungrateful, arrogant or proud – let me explain. Elijah, after confronting King Ahab, has an extraordinary 850 -1 encounter with the false prophets of Baal where he issues the challenge that the God who answers by fire, He is God. It is a well-known story; as Elijah calls on the name of the Lord, the fire of God falls and consumes the sacrifice, from the top to the bottom. Elijah promptly declares the drought is over and the rain is coming. After much prayer, the skies open with a torrential down-pouring. It is a great story, but on hearing about Elijah’s exploits from King Ahab, Ahab’s psychotic wife Jezebel issues venomous death threats to Elijah. Despite the overwhelming interventions of God, and with 400 false prophets put to the sword, Elijah is scared and goes on the run. Simply put, Elijah wants to die, prays for a premature death, but his objections are met by yet another intervention of God. He will later be informed by God that he is not unique and that there are 7,000 others who have not bowed the knee to Baal, but in the interim God provides once again for him. He is instructed twice to eat hot food and drink water prepared by the angel, sleep and then go to Horeb the mountain of God (aka Mt Sinai), the place where God made himself known in the key moment of Israel’s history. A strange order, no one else is told to go back to Horeb. With the privilege of hindsight, we get to see that Elijah has some amazing encounters, especially for someone who believes that there is nothing more to live for. On Horeb, hiding in the cave just waiting for God he might have reflected on God’s history of protection, presence, love and relationship towards His people. I doubt it. He just waits for God, cold, hungry, miserable. If you are listening for that gentle whisper, remember it was the end of Elijah’s ministry. Again, you are familiar with the story; God sends a powerful wind that starts to tear the mountain apart. But the wind isn’t God. Then he sends an earthquake that shakes the mountain. But the earthquake isn’t God. Then he sends fire like he sent on Mount Carmel at the time of Elijah’s greatest victory. But the fire isn’t God. Then comes “a still, small voice, a gentle whisper” but the New Revised Standard Version says it was “the sound of sheer silence”. God turns up and asks the question, “What are you doing here?” Elijah should have replied, “Because you told me to!” But he is not me! That’s the story. Elijah is told to go and anoint a king and a successor. If you are listening for that gentle whisper, remember it was the end of Elijah’s ministry. Everything is now about putting his house in order, so to speak. We are very prone to over romanticise the Bible, and read ourselves selectively into narratives where we do not belong! Heart-searching question; Whose mantle are you seeking? Joseph had a very nice coloured garment. The brothers tore it, put animal blood on it and returned it. No one could wear that garment, nice as it was. It was Joseph’s. AD33 and Roman soldiers take interest in their captives’ purple robe that is seamless and cast lots for it. It belonged to the Saviour of mankind, who was about to give His life for the sins of the world. Another garment no one could wear without facing difficult questions. Here’s the deal. God told Elijah to go anoint Elisha as a prophet in his place. How would you feel about that? Elijah comes down from the mountain and goes looking for Elisha. When he finds him he has an odd way of anointing him as a prophet. The word anoint in the Hebrew means to smear or to rub. We are not actually told that Elijah did that here, there is a lot of time and distance mentioned in the narrative before Elisha takes his place for this to formally happen. What we are told is that Elisha is ploughing a field with 12 pairs of oxen, and he is on the last pair, working the field. All of the commentaries seem to infer that Elijah’s mantle is made from animal skin, a shaggy coat of untanned skin, with the hair outward. Elijah is not a man of great wealth and it could be considered that this garment has been worn in the field, and is certainly not a coat of many colours. It smells of Elijah, it probably needs cleaning, but it is warm. Such a garment seems to have been worn by the later prophets (Zechariah 13:4; Matthew 3:4) and to have been regarded as a sign of their profession up to the day of Isaiah. Elijah’s mantle – It smells of Elijah, it probably needs cleaning, but it is warm. As Elijah walks past Elisha the Hebrew text tells us he “threw” his cloak a on him. Does that tell us something about how Elijah viewed the recruitment process? The scripture tells us something interesting, Elijah didn’t stop. Elisha surely was surprised at first, it was almost like being assaulted! We are not told that Elijah said anything, all we know at this point is that Elisha has to run after him for clarity and direction. Now we start to join the dots. Elisha sacrifices the oxen that he has. What sacrifice is this? Whatever it is, everyone joins in this departure celebration – are some of the attendees those from among the 7,000 who have not bent the knee to Baal? With a full stomach, Elisha has to go and find Elijah again. The wet mantle of Elijah was now Elisha’s. Later, at the far end of the story, Elijah seems to have reclaimed his cloak and as he approaches the Jordan, he rolls up the garment and strikes the waters. Later, after Elijah is taken from him leaving behind the cloak, Elisha rolls it up and struck the water, and just like for Elijah, the Jordan waters separated. I recently heard of a group of people who have taken to visiting and laying on the graves of famous people in an attempt to somehow receive their anointing. It is a misplaced sentiment. A dead man is thrown into a cave and lands on the bones of Elisha and comes to life. It is certainly a miracle, but he does not receive Elisha’s anointing. (2 Kings 13:21) It’s not going to happen, and we need to stop this nonsense and instead, in simplicity saturate our selves with love and affection for Christ instead of a quest for an unnecessary and distracting “anointing-fix”. We are not told by Paul to covet other peoples gift or calling, what we are told to do is to eagerly desire the gifts of the Spirit, especially the gift of prophecy. Yes, go after what God lays on your heart, but it is only as the Spirit of God enables you that you can do anything. Here’s the good news. What happened at Pentecost is sufficient for you. You don’t need another top up, you just need that daily relationship with the Spirit of being filled daily. We don’t need another Pentecost, what God did then, is what He is still doing. We have equated the word “Mantle” with “anointing”. The anointing you have as you live your life is sufficient for you to be able to face the challenges that God sets before you, and to overcome them. You are called to relationship with Him, not a collection of mantles. The truth be known, if there was one mantle that you have, it is that you have put on Christ Jesus. What happened to Elijah’s mantle? It grew musty, dried out at the edges and then began to deteriorate and then slowly turned to dust. It no longer exists. His story does, and Hebrews 11 tells you about all the great champions of faith and their exploits, but only so that the writer can point you to with great confidence and conviction to the Author and Finisher of our faith, Jesus. The truth be known, if there was one mantle that you have, it is that you have put on Christ Jesus. You have been clothed with His righteousness, free from condemnation, shame and guilt. Having put on Christ you are reconciled to God forever, not just a friend, not just a servant – He has become your Father, and your sonship is eternal! Now, THAT IS A MANTLE! אַדֶּ֣רֶת ’ad·de·reṯ – literally cloak, but ‘mantle’ sounds so cool!